I am hoping that this is the penultimate army I will start in my Napoleonic collection. I just need to control myself. My long term goal has always been to fight Quatre Bras, so the last army should be obvious. I have always wanted to paint the Black Brunswickers and they will also, I hope, have some use as allies for the Austrians. Here is a nice brochure put out by Wargames Illustrated. I have purchased enough figures to do the whole Brunswick Corps as present at Waterloo. They are all Perry figures and I will end up with a Corps command stand, 3 Brigade commander stands, an avant guard battalion, 3 battalions of line, a guard battalion, 3 battalions of light, a regiment of Hussars, a company of Uhlans as well as a battery each of Horse and Foot artillery. About twice the size of my Hanoverian brigade..........and all in black! I am hoping they will be fairly quick to paint because of the fact that almost all of the uniform and equipment is black. So really black, then flesh/hair, coloured epaulets, collars and trouser strips as well as minimal number of equipment pieces. I just hope I do not get bored. I picked the third light battalion with which to start, as they were going to be my Halloween battalion for obvious reasons, unfortunately they were not photographed in time and they have been done for a month now. I have just been quite busy. They fielded 691 men at Waterloo under Major von Ebling. So essentially these were primed white and then had a black ink wash applied. I am not really sure about the results so I will try something different on the next unit in respect to the black. The bright colours on all the Brunswick battalions makes them quite attractive. Only the line battalions carried standards. As you can see there is quite a lot of black. Very nice indeed, the black looks very good in my opinion and certainly appeals to my taste rather than stark grey dry-brushing so often seen. I knew it! Well... You probably told me anyway. Fantastic work on this Brunswick battalion, the colours are great! I recently migrated to the Andrea Black-set. That thing really has changed my painting. Oh and the miniatures are great! Awesome paint work on these guys. 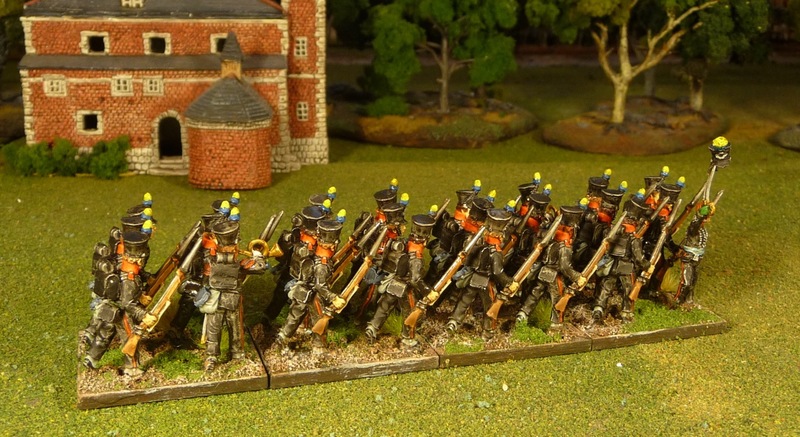 I really like the Brunwickers and have done the Waterloo corp in 20mm. Looking forward to more. A good start to a collection - id like some Bunswickers, quite a change from red! Nice debut there John. How can anyone not love those uniforms! They look really good. I love your painting, very inspirational. "Men in Black"! They look great. I've had my own small Brunswick Corps for 20+ years (Minifigs)... really have to do some British to go with them! 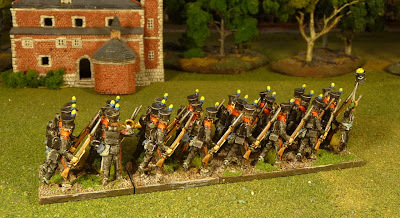 My long time friend Joe (Fish Tales blog)has been painting the same troops, also Perry, and also as a part of his own Quatre Bras project. Seriously, though - you don't ever expect to be *done* painting Napoleonics, do you John? It's been almost 45 years and I'm still at it - enthusiastically! Thanks everyone, I am a little surprised most thought the uniforms looked ok. The transitions were a little rough in my opinion. We will see what you think of the next battalion. Peter: I am not done, just hoping to restrict the number of armies I am painting! The black looks good one the photos. If you are unhappy with it... I always use a black base and drybrush / highlight with a 1:1 mix of black and a very dark blue (like prussian blue) which gives very realistic results. Excellent work, John! I think I'm going to do some of these in the future so I'll be watching your progress with great interest. beautiful looking battalion. The brunswicks keep calling me to do a 1815 army.